Which sounds pretty big, like there’s a development contract or something. The truth is that I’m developing a game featuring our boy Jones. In my day job I teach a computer art/multimedia class. This year I’m having my students design art and animation for a platform game. If you’re my age, that unfamiliar term refers to your typical Mario Bros. game, Donkey Kong, etc. It made sense for me to demo the project by developing a game myself featuring the world of Keeping Up With Jones. 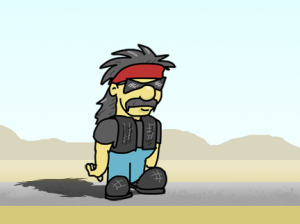 I’m not sure if my readers are into this kind of game, but a number of you who might be in my age bracket might get a kick out of playing a game that features a biker edge, not to mention your favorite cartoon character. (leaning in closer) Which is Jones right? Jones, Doc, Porkins, Longarm…anybody from here. The intimidating inference was not to pick someone from another strip. But seriously–I ain’t the top of the food chain in comics, but it does seem sometimes like a few people like the strip! Well I definitely seem to be a fan, the time i spend on your site should be obvious by the quantity of comments i leave. Only comic i actually follow are jones and motobasturds. speaking of which ive been finding myself wondering who would win in a jones vs big o biker build off. True enough Alan. Mighty glad to have ya. But dontcha think if you’re going to plug Motobasturds you should include a link? any idea when your gonna release this game? I update the release when I can. Currently working on the overall concept and a few technical details, like making the background move in paralax when we move through the scene, and using objects like trucks, cars, and hotels instead of stupid little blocks. I’m also planning out the changes in levels and scoring, as well as some more complex scoring rules related to the player’s cash (score), needed parts, bail amounts, and current violations.